Valentines is here and many teachers will teach a lesson about “love”. However, it’s a topic that you can teach at any time of the year, always valuable and really can get students thinking deeply about their place in the world. Here are a couple of simple ideas for language teachers. Many more “lovely” ideas for EFL Classroom 2.0 members on our community (we have over 180,000 resources, not to mention all else). Also see this nice list of “love” lessons. 1. Listening skills. 7 Billion Others. I love this anthropological project – 7 Billion Others. Such great language material, interviews with people around the world about simple topics of concern to all peoples. I’ve edited and compiled a video with all the English responses about “love”. Teachers can use them in class and get students to take notes, discuss their ideas. Also, can they guess the accent? Many different ones. Get the videos individually for offline use HERE. So easy to do. Just put up the template on the board or an overhead. Write a poem together as a class, soliciting responses from students and writing them down. Once finished, recite your class poem! Next, students can write their own and present to the class. 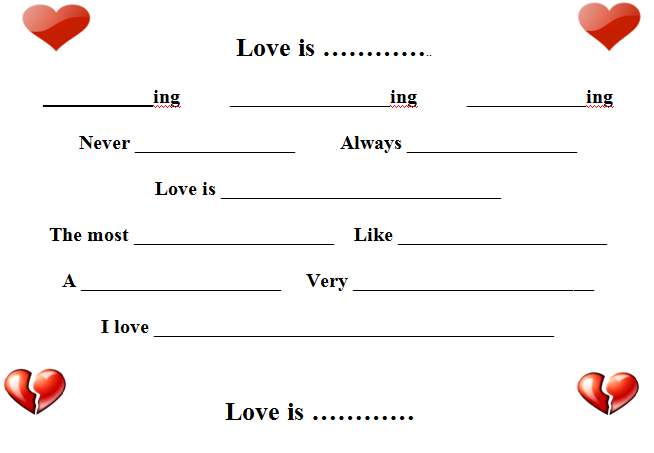 Here’s a nice template for a grammar poem about “love”. Download the template Get many more grammar poem templates and poem ideas on EFL Classroom 2.0. 3. Funeral Blues – W. H. Auden. This is a eulogy but also a deep poem about love. This video is contextualized and fantastic. Students can do a listening cloze and then even rewrite the poem (handouts and mp3 on EFL Classroom 2.0). Study the poem and quiz the vocabulary with the Gif Lingua book I produced (register as a teacher and download). What “lovely” ideas do you have to share?